Recently I went back to Wales for the weekend to spend time with some friends and ride my bike. Friday night was curry and a few beers and Saturday was a school reunion. This meant that both my bike rides took place with me in a slightly fragile and hungover state. This also meant that hydration was going to be an important factor on both days! Anyway that’s not so important, let me tell you a little about the rides. The ride on Saturday was going to be about going down hill: an old friend of mine was going to show me some downhill runs close to where I used to live with my parents – about 4 miles away to precise! 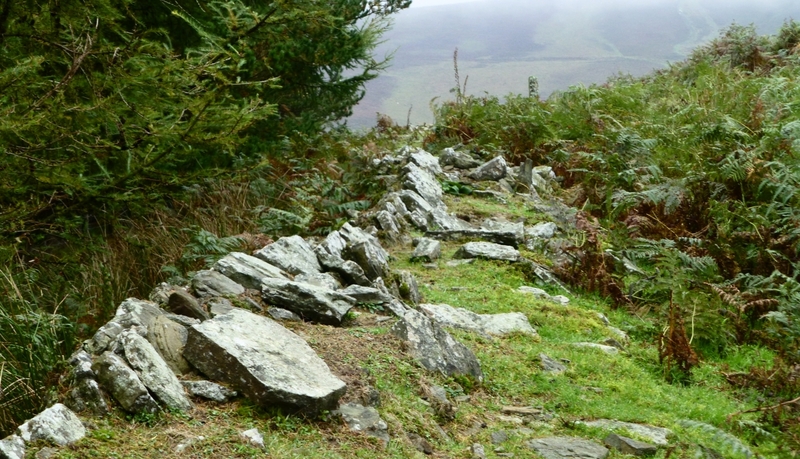 This area of Wales, close to the Brecon Beacons, is where you will find the Cwmcarn Trail center and many, many not so official down hill trails. I love riding in this part of Wales as I have some friends who know the area very well and there are treats on just about every hill side! The newly opened Bike Park Wales is only 30 minutes away too. Hafodyrynys Colliery was located east of the village. The mine was actively worked from 1914 until 1966. It was redeveloped by the NCB in the 1950s, including the creation of new drifts. However, it never fully lived up to production expectations. Today the remains of the washery are a listed building and mark the site of the mine. The mine continued to process coal from other collieries following its closure. We set off from Hafodyrynys (now you know it was in Wales for sure!) and rode up the hill to Mynydd Llwyd keeping the valley floor and road down to our left. After 6km and about 250m climb we came to our first descent. By now we were getting a little concerned about the state of the trails and John was debating which of the lines to take; we opted for G-Line and it was great. The twisty rooty trail descended through the damp forest quickly, reminding me a little of the top section of the Gorlech Trail at Brechfa. Commitment is required when negotiating wet roots and nothing but a straight line will work no matter what tyres you have opted for. There were one or two slides to say the least as many parts of the descent were also off camber making it a really technical and challenging ride. At the bottom of the trail, 250m below we crossed the road and headed slowly up the steep fireroad climb to the next trail at Ty Shon. I must have accidentally paused my GPS or something as the curve looks impossibly steep on the graph – while it was a tough push up at one point it certainly was that steep! Before descending I noticed a few sights from the view point that it took me a while to recognise. We weren’t far from my old comprehensive school and I could see a local beauty spot a place we used to drive (and er park) to – LLandegfedd Reservoir. It was quite a nostalgic view point, I only wish I had taken some photos. The Ty Shon descent took us into the neighboring valley and Plas-y-coed village. To be honest I didn’t enjoy this at all. After a sketchy and slippery start I noticed my friend fall in front of me at the bottom of a pretty steep drop in. It wasn’t the steepness or roots or a rock it, it was simply that fact that the ground was slippery that your brakes were of no use whatsoever. I had no choice but to follow – and I also fell, face first into the bracken and sodden leaves and pine needles. No pain or damage to me or the bike but a severe set back in confidence. The rest of the way down was spent trying to avoid similar accidents. This wasn’t possible and in descending less than 150m I must have dismounted the bike in various ways about 6 times. Time to move on! We pedaled up the road to Pantygasseg (are you loving these names or what?) and eventually our final descent of the day known as Cochy. This was surprisingly dry compared to Ty Shon running off the same hill. Flowing and dropping through the pine needles we finally got our real fix for the day. Some of the locals do this under 2 minutes. With some caution as it was wet, being new to the trail and having just had a few offs I did this in just under 4. Really steep in places and some big drops to finish at the bottom this was by far the best bit of the day. Wet, muddy and a tiny bit battered by Ty Shon we rode back to the car thankful that no one got seriously hurt! Hang on for Part II – where the title of the blog post makes a little more sense!